Welcome to Laughing Bear Lodge! Planning a family reunion or gathering can be a stressful experience. Making everyone happy is no easy task and you want to make sure family members of all ages will have plenty to do. If you’re searching for the best North Georgia vacation rental to host your family reunion, look no further. 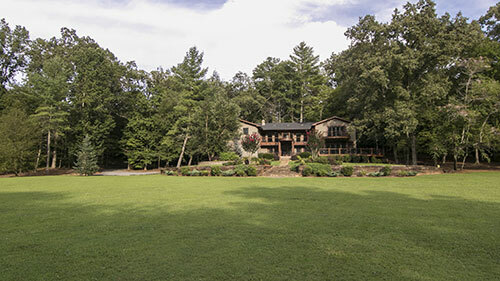 At Laughing Bear Lodge, located on a gently bubbling trout stream and tucked away in the North Georgia mountains, you can make your next family vacation truly unforgettable by reserving this luxury rental. 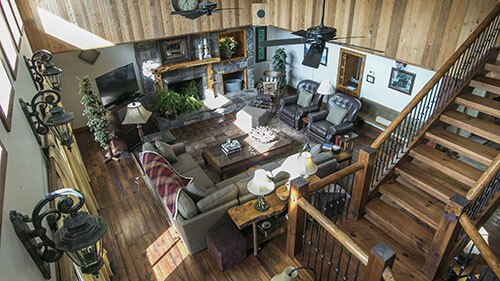 Laughing Bear Lodge comfortably accommodates up to 40 guests and has parking for 10+ vehicles. 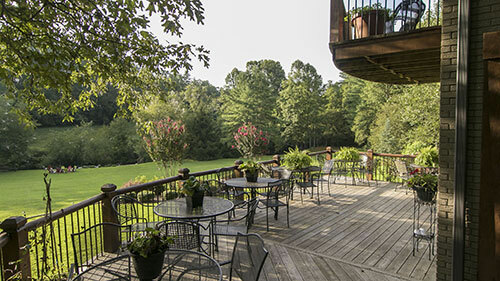 The lodge is conveniently located about an hour and a half north of Atlanta, and 10 miles North of historic downtown Blue Ridge in the North Georgia Mountains. It’s an idyllic location for your next reunion, large gathering or vacation, and your family will be talking about it for years to come! 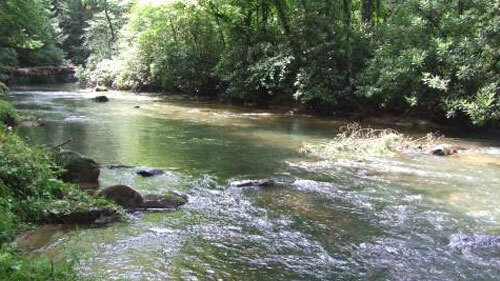 Tucked up against highly sought-after Fightingtown Creek and surrounded by 14 secluded acres of lush hardwood forests in the heart of the North Georgia mountains, this private waterfront getaway near Blue Ridge, GA is the perfect private setting for your next family reunion or gathering. Offering 10,000 square feet with plenty of space for large families and groups, this luxurious lodge easily sleeps 10-40 people in 20 individual beds and four sleeper sofas. The magnificent 600 sq. ft. great room boasts 20-ft cathedral ceilings along with three balconies circling above. Enjoy a family meal together on a custom made, 14-ft- farm table constructed with 200 year-old antique heart-of-pine. The kitchen includes two full-size dishwashers, two full-size double sinks, double convection ovens, 5-eye cooktop stove (gas), two refrigerators, a standing freezer, seating for 12-14 around the granite bar, and enough space for everyone to gather around. 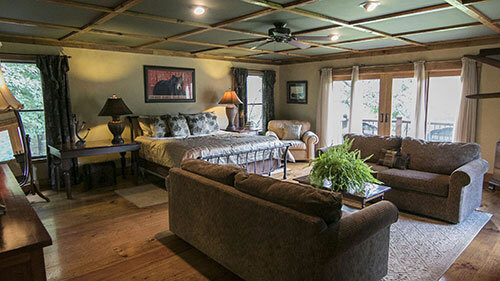 At the lodge, your entire family will immediately feel right at home in this warm and inviting North Georgia getaway. The beds are soft, the stacked-stone wood-burning fireplace is warm, and the idyllic scenery is calming—a perfect escape to spend quality time with the people who matter most to you. Sit back, relax, and enjoy the beautiful North Georgia scenery from the master suite private balcony or the sunroom on the main level, featuring custom stone & wood and two 12 ft. sliding glass doors. Or grab a warm cup of coffee and enjoy the picturesque morning view of a rustic barn and grazing deer from one of two large exterior decks. This luxurious family getaway rental is filled with ample amenities, gourmet kitchen appliances, a spa-like bathroom in the master suite, and much more. 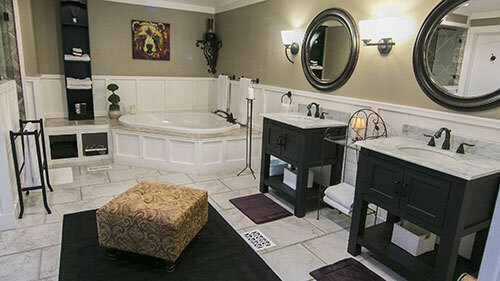 Experience unique resort-style luxury not commonly found in North Georgia. For animal lovers in the family, you’ll find a diverse collection of wildlife to enjoy all around— starting with the world famous Rainbow Trout in the picturesque bubbling trout stream. Other animals that frequent the area include raccoons, foxes, rabbits, chipmunks, songbirds, frogs, salamanders, otters and more. Also, on occasion, you can view grazing deer across the creek. Whether it’s tubing and fishing in Fightingtown Creek, playing frisbee in the 4 acre lawn, lounging by the babbling creek or getting a top score in the Rec Level arcade, there’s plenty to keep the whole of your family occupied. Want to get some exercise? Take a stroll around the 14-acre property, spend some time in the workout room or play a game of pickup basketball in the indoor racquetball court. Want to watch a movie? 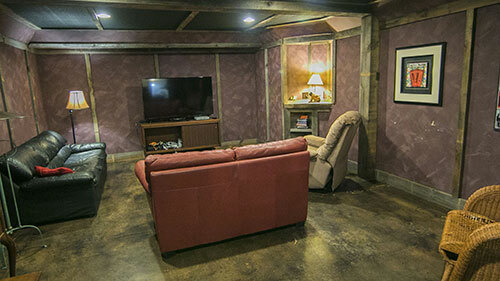 Curl up and have a family movie night in the Rec Level TV room. Or listen to your favorite tunes while preparing dinner or playing games through the Central (300CD) Sound System, which plays in 4 rooms (8 speakers). 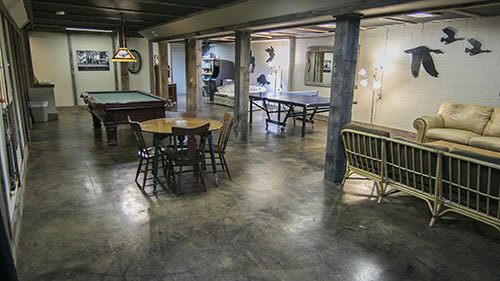 Tucked away in the North Georgia mountains, Laughing Bear Lodge is perfectly situated to take advantage of all the South has to offer. 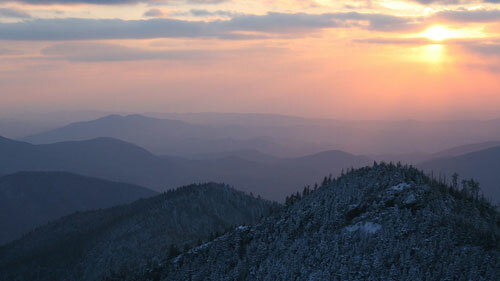 Take a short drive to Great Smoky Mountain National Park and Gatlinburg, hike a section of the Appalachian Trail, pick apples at Mercier Orchard, go rafting down the Ocoee River, shop and dine in historic downtown Blue Ridge, hike a waterfall in Ellijay, GA, visit a local brewery or winery, check out a drive-in movie, go horseback riding—the options are limitless! Book Your North Georgia Family Vacation Today! We get booked well in advance, so be sure to check out our available dates and reserve early! To learn more about this ideal spot for your next family reunion or gathering, contact Leslee by calling 706-492-3311 or email us.